I’ve never been a coffee drinker; it’s one thing I’ve never acquired a taste for as I’ve gotten older. But I do love chai tea. And ever since I’ve had kids I sometimes feel the need for a little caffeine boost. I used to buy boxes of pre-mixed chai tea bags but one day it occurred to me that those boxes cost 3-4 times more than basic black tea and chai is just black tea with some spices added. 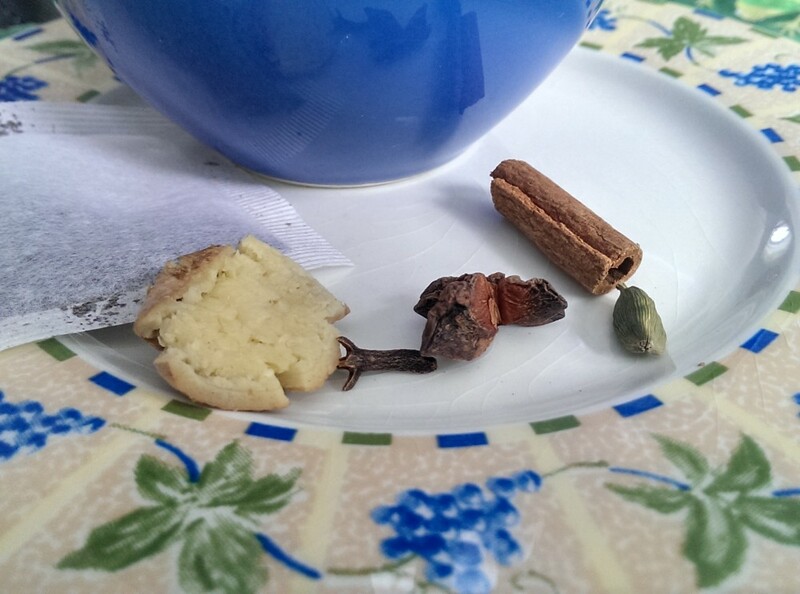 There are plenty of recipes on-line for chai but this is what works for me and what I find to be a very simple method: put a black tea bag in a mug and add half a cinnamon stick, one or two whole cloves, a cardamom pod (slightly crushed) and an anise star (or piece of one as you see in the photo). If I happen to have fresh ginger on hand then I might also cut off a thick slice, crush it slightly and add that to the mug as well. Then fill the mug about 3/4 full with boiling water and steep everything for about 5 minutes. Finally, top off the mug with soy milk (or another non-dairy milk) and add sweetener to taste (I like just a tad of agave). You could also add all the spices and some loose black tea to a tea ball and that would probably cost you even less. Enjoy!